1. There are 115 elements known to now. 2. Brass and bronze are highly sonorous and so used in making bells. 3. Silver is the best conductor of electricity followed by Cu, Au, Al, and W (Tungsten). Mercury and lead have low electrical conductivity due to high resistance. 4. Amphoteric oxides being acidic as well as basic, turn red litmus blue as well as blue litmus red. 5. Alkalis turn phenolphthalein pink and turn red litmus blue. 6. Metal oxides react with acids to form salt and water. 7. 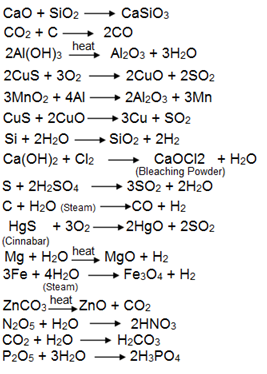 At room temperature metals like - Al, Zn, Cu, Mg, Sn, Pb form oxide on their surface and became dull. Mercury forms red coloured oxide, HgO. 8. Non-metals gain electrons to form negative ions in order to compete their octet ie., 8 electrons in their outermost orbit. 9. Metals tend to loose electrons to acquire nearest noble gas configuration. 10. Iodine is a non-metal but has metallic lustre. 11. Gallium (Ga) is a metal which becomes liquid if kept on palm. It has very low melting point while its boiling point is very high. Because of this property it is useful for high temperature thermometers. 12. Tungsten (W) has the highest melting point. 13. Graphite is the only non-metal which is good conductor of heat and electricity. 14. Non-metals have generally low density except diamond which has high density. 15. Non-metals generally not firm alloys. Only exception is carbon which is alloyed with iron to form steel. 16. Cinnabar is a bright red naturally occurring form of Mercury sulphide, HgS. It is the chief Ore of Mercury. 17. Blister copper is a kind of impure copper having spots or blisters due to evolution of Sulphur dioxide. 18. Sodium Chloride (NaCl) does not exist as molecules but as aggregates of oppositely charged ions. Metals are the elements which are usually hard, malleable and ductile. They are sonorous and have metallic lustre. Metals are also good conductors of heat and electricity. Metals are mostly solids with high density and high melting and boiling points. They can loose electrons easily from positive ions. 1. Some metals like sodium and potassium, magnesium are the only metals which can be cut with knife. 2. Mercury is the only metal which is liquid at room temperature. 3. Lead, Sodium, Potassium and Lithium are the only metals which are not ductile. 4. Pb and Hg are poor conductors of heat. The process of forming oxide layer on the surface of metal is called anodising. For example, aluminium forms an oxide layer on its surface when exposed to air. This layer of aluminium oxide protects aluminium from corrosion. The layer can be made thicker with the help of anodising. Aqua Regia is a mixture of conc. HCl and conc. HNO3 in the ratio of 3:1. It can dissolve gold and platinum although none of these two metals react with conc. HCl or conc. HNO3 alone. Aqua Regia is a strong oxidising agent due to the formation of NOCl (Nitrosyl Chloride) and Chlorine produced by a reaction of two acids. It is highly corrosive and fuming liquid. Therefore, Aqua Regia should be kept away from eyes and skin. Non-metals are those materials which are found in all the three states (solid, liquid and gas), non-lustrous, non-sonorous, and neither malleable nor ductile. These are bad conductors of heat and electricity. The oxides of non-metals are acidic in nature. Non-metal elements tend to gain electrons and form negative ions (anion). Non-metals have generally low melting and boiling points except diamond, graphite, boron and Silicon which have high melting and boiling points. (i) Alloys do not get corroded or corroded to very less extent. (ii) They are harder and stronger than pure metal, e.g., gold mixed with copper is harder than pure gold. (iii) Alloys are less conducting than pure metals, e.g., copper is a good conductor of heat and electricity whereas its alloys like - brass and bronze are not good conductors. (iv) The melting point of an alloy is less than that of pure metals. For example, Solder, which is an alloy of lead and tin, has lower melting points than either tin or lead. Solder is used for soldering (welding) of electrical wires. In an alloy, if one of the metals is Mercury then the alloy is known as amalgam. Minerals are the natural materials in which metals occur in the form of their compounds. Minerals are found in the earth's crust and also in sea water. The substance which reacts with gangue to form a fusible mass which can easily be removed, is known as flux. For example, in the extraction of iron from ore, CaO (as lime) is used as flux to remove SiO2 (Silica) which is present as gangue. This is the fusible mass formed by the reaction of flux and gangue is known as slag. Slag is lighter than molten metal and so floats over the molten metal and can be easily removed. It prevents metal from oxidation. Froth flotation is a concentration process of selectively separating hydrophobic valuable minerals from hydrophilic waste gangue. In mineral processing, Froth Flotation method is used for the concentration of sulphide ores. The sulphide ore is mixed with water and pine oil. The mixture is then agitated with the blast of compressed air. 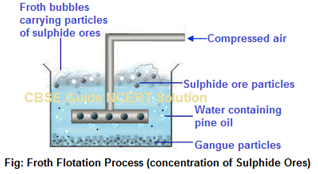 In this process sulphide ore gets collected in Froth and gangue particles settled at the bottom of the tank. Sulphide ore is thus, separated and dried.